Nestled in a cosy corner on the first floor of our BMMI Bahrain Headquarters is a group of individuals frantically following up, typing away and making phone calls to ensure that deadlines are met, clients are happy and contracts are signed. 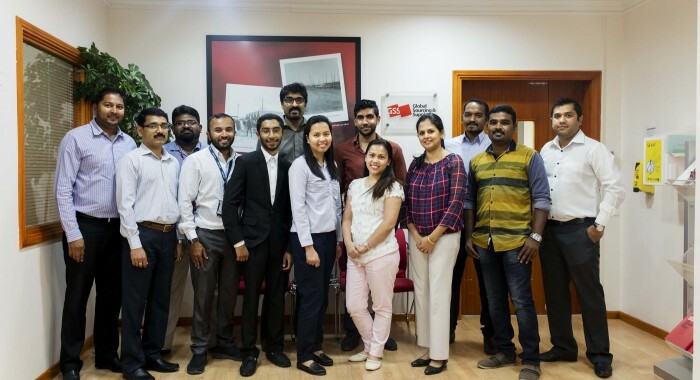 We know they work hard, but what do we really know about the GSS Bahrain team? Well, after 13 years of operation, our Prime Vendor (PV) contract came to an end early last year. However, in order to retain talent in BMMI and to better serve our customers, GSS Bahrain was born, merging technical and food sourcing and supply, to make one integrated team. It is this team that the Corporate Communications & CSR team had to opportunity to spend the day with. From the moment you walk in, you know they are working hard to improve the capabilities of GSS Bahrain. They still continue to serve many of their previous clients, including the US Navy, Navy Exchange (NEX), KBR and Chisholm Enterprises, but the business has also expanded, serving new clients and even securing opportunities internationally. Moving from serving just one client to now building up a portfolio of customers has proved to be an exciting challenge, one the team are both grateful and enthusiastic for. Logistics Coordinator, Linda D’ Rozario joined BMMI in 2007 and explained that GSS used to serve clients such as KBR, the US Navy in Bahrain, Nobel, PAE and TWI. “But now the volume is higher, the demand is higher and we are in more locations than ever. The bidding has increased which makes more work for us, but it keeps me busy and I am getting more experience…something I really enjoy,” she said. Team Supervisor, Madhu Menon agrees. The team have collaborated with many departments and have sought help from employees across the business. Madhu started at BMMI in 2007 and was previously the Customer Account Supervisor. He explained that it was a smooth transition to GSS Bahrain because of the support from management. “Support and collaboration is what helped with the change,” he said. “Of course there was uncertainty in the beginning but we are now well on our way. It is more challenging and we do a lot to ensure our customers are happy with us, but it keeps us busy and we are always on the lookout for new business opportunities,” he said. Like Linda, Madhu believes that working together across the BMMI Group can be very rewarding. Earlier this year, we got in touch with Procurement Assistant & Customer Service Executive in BMMI Djibouti, Yasmine Mohamed Ahmed, who played a crucial role to secure a contract with COLAS, a major contracting company in Djibouti, to supply them with fly ash. Sales Manager, Charles Swamy has been with BMMI since 2008. With over seven years’ experience with PV, he says that although his new responsibilities may be chaotic at times, it has its similarities to when he was the Customer Service Supervisor. “I still carry on with PV work and close accounts, as well as maintain a relationship with our previous clients, some whom are still with us,” he said. “Now it is split between contractual and commercial, businesses with commercial being somewhat new to me, so obviously there are difficulties however I am still learning which is exciting for me. As a division, we are still evolving and constantly trying to build connections,” Charles added. Charles is always on the clock, dealing with inquiries and complaints. Together with his team he handles all food business that comes out of NEX, Chisholm Enterprises and commercial market which is responsible for 75% of the revenue out of the division. It can be intense and there is a lot of competition out there, but GSS has an edge, according to Charles. “What makes GSS Bahrain different is that we provide exceptional service and quality to our customers as well as providing them with round the clock solutions in order to make the customers life easier. We are currently supplying perishable products such as Deli meats, Dairy and Irish Beef imported weekly from US and Ireland and are constantly looking at adding new products to our inventory and bringing in brands that we think we can sell in order to grow our portfolio of products,” he said.